Ozeki NG SMS Gateway can be used to send MMS messages to MMS service providers over the MM7 protocol. In this article you can read about this solution and you will find a helpful configuration guide with screenshots to setup your system. MM7 connection can be used to send and receive multimedia messages between computers and MMS-enabled mobile phones. MM7 is an interface between Value Added Service Provider (VASP) and Multimedia Messaging Service Center (MMSC). It is specified by 3GPP and it is based on Web Services. The protocol communicates through HTTP and uses SOAP/MIME/XML message format. Today practically all MMSCs have implemented the MM7 interface. By using MM7 protocol, service providers can send and receive MMS messages, and can receive and read delivery reports. With the use of MMS (Multimedia Messaging Service) in your corporate communication you can extend the functions of SMS text messages as MMS messages can include multimedia content. With a powerful and stable SMS gateway software you can send and receive MMS messages to and from mobile phones. To achieve this function you can use Ozeki NG SMS Gateway software. To be able to send MMS messages using Ozeki NG SMS Gateway, you need to connect your gateway software to the MMS center of one or more service providers. You can do this in the following way: If you wish to increase speed, reliability and performance you can connect directly to the MMSC over the Internet. In this case, you can use MM7 protocol to connect your gateway. To implement this solution you need a contract with a service provider. Therefore the service provider will provide you the necessary information to be able to connect to their MMSC. In Ozeki NG SMS Gateway the messages are submitted using the MM7 protocol which allows you to connect to an HTTP or HTTPS webservice provided by an internet based MMS service provider. The service provider will provide the parameters that are needed during the configuration such as MMS Post URL, VAS ID, VASP ID (Value Added Service Provider). To configure your gateway please follow the steps below. First, start Ozeki NG SMS Gateway software and login with your username and password. On the left hand side of the interface of Ozeki NG SMS Gateway, click on "Add service provider" (Figure 1). Then select "MM7 connection" from IP MMS connections. Click on "Install" next to it (Figure 2). In "Configuration" pane select "General" tab. In "URL parameters" section you need to specify the connection parameters for the MM7 submission of the MMS messages. The parameters are provided by your service provider after you have signed a contract with them. These information are: MMS Post URL, MMS Receive URL, VAS ID, VAS PID. You also need to specify the MM7 version information such as 3GPP MMS version and MM7 schema in "Protocol version" section. These parameters are also provided by your service provider. Protocol paramters like service code and password can also be entered in this tab (Figure 3). In "Connection" tab you can set the values for "HTTP authentication". 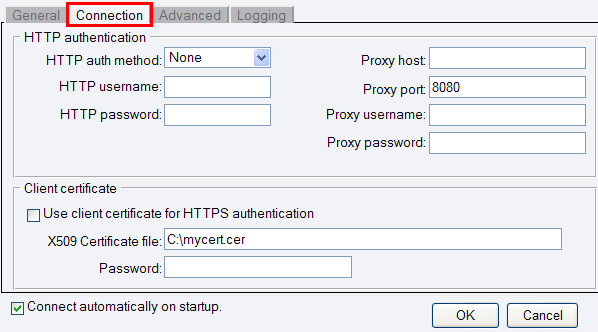 In "Client certificate" you can check "Use client certificate for HTTPS authentication" checkbox and you can also provide the path for X509 Certificate file (Figure 4). Next switch to "Advanced" tab. In "Identification" section you can specify the sender ID with an e-mail address or with a phone number. Also type in the provider's name. 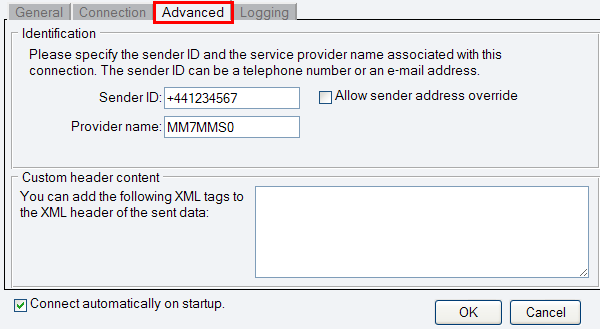 In "Custom header content" section you can add some XML tags to the XML header of the sent data (Figure 5). In "Logging" tab you do not need to do any configuration as there are default settings. If they are suitable for you just click on "OK". These default settings are the follows: "Log sent and received messages in human readable format" option is enabled in the "Logging" section. The "Log directory", the "Maximum log file size", and "Number of rotated files" are also provided by default in "Log file settings" section (Figure 6). Click on "OK" to finish configuration. 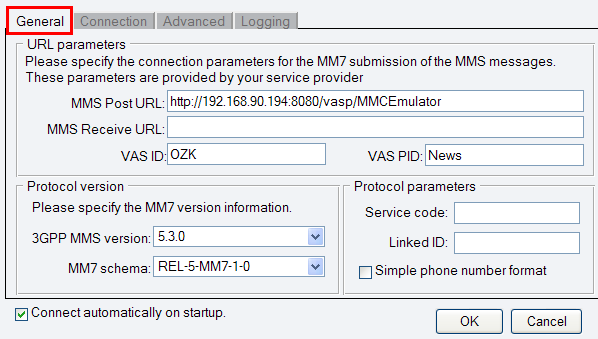 If you click on "Management" you will see the created MM7 connection under "Service providers" on the left side (Figure 7). Now to compose an MMS message, click on "Compose" (Figure 8). Then select "Multimedia Message (MMS) from message types (Figure 9). Then you can start compose your message. To send your message you need to provide the message type, and a recipient phone number. After this specify your subject and compose your text message. Finally, browse for an attachment and click on "Send" (Figure 10). To summarize the above mentioned up, you can send MMS messages with Ozeki NG SMS Gateway over MM7 connection from computers to mobile phones. To achieve this function you can easily configure your gateway in a few steps. With this solution you will gain a stable, reliable and well-functioning system which you will be able to save time and money with. If you have not downloaded Ozeki NG SMS Gateway yet, please go to the download page where you will find all the necessary download information.